The flat cam mechanism has the following characteristics: Pressure on two sides. 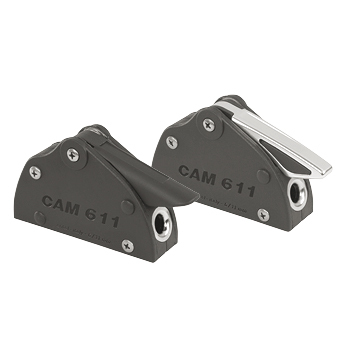 Above, the flat cam exerts pressure on the line automatically, simply by pulling the line. Below, the clutch base accepts several line diameters. Line range. A flat cam allows the use of several line diamters. This is useful in case you want to change a lineand maintain the same clutch. small clutches with flat cam go from 6 to 10 mm line diameter. Line retrieval with closed lever. Line retrieval can be achieved with the lever closed. The line stops automatically in the new position with no slippage. Emergency opening. The line can be released under load without the use of a winch because the Antal mechanism guarantees easy opening even under heavy conditions.